Chicago Teachers Union President Jesse Sharkey issued the following statement today in response to the release of Illinois State Board of Education report card data. Schools that are under-enrolled and have received low ratings are again located in the same communities where they have always been—areas struggling with disinvestment, unemployment and vacant properties. 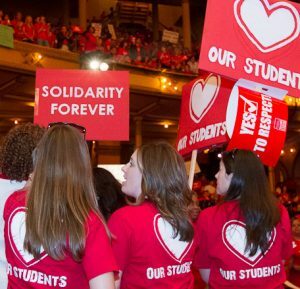 While the new Illinois State Board of Education (ISBE) ratings supposedly now focus on growth as opposed to achievement, the results unsurprisingly still reflect the unequal and inadequate investments doled out and the conditions in which schools exist. ISBE’s designations of “exemplary,” “commendable,” “underperforming,” and “lowest performing” continue the notion that ranking, sorting and labeling schools provides new insight. But what we already know is still true—ranking, sorting and labeling in a school system plagued by segregation and inequality does nothing to address the underlying issues. Schools ought to be recognized for making gains in a system which fails to provide them with adequate resources, but what is really needed is investment in the schools that we already know need help. Chicago Public Schools still has its own ranking, sorting and labeling School Quality Rating Policy (SQRP) system which agrees with the new ISBE ratings in some cases, but also differs dramatically in others. What are schools supposed to do with information which either tells them what they already know or, in other instances, sends them a mixed message? CPS categorizes schools that are not in “good standing” as either “provisional” or “intensive support,” but what specifically is the support that CPS provides? A revolving door of network chiefs? Unrealistic and unattainable test scores? Slashed school budgets? When schools in these communities attempt to organize and improve to save their schools, parents, educators and staff are told that they have no rights when the school is on probation. Yet years of school research has shown that authentic parent and community involvement is precisely what improves schools. The fear and uncertainty of school closures is enough to make test scores plummet. The color-coded SQRP system is like a traffic light that tells parents (and realtors) that a school is either welcoming, or to enter at one’s own risk. Parents have no idea of the wonderful things taking place in a Level 2 or 3 school because the bright red label scares everyone away who is in a position to take their children elsewhere, thereby reducing the school’s enrollment and budget, and further preventing the school from improving. When ratings drop, parents who can flee, do so, leaving behind too many students who need crucial support that they are not going to receive. Meanwhile, parents in affluent communities raise their own funds to pay for whatever programs CPS cuts, furthering the advantage those students already receive by attending a popular Level 1+ school. When mayoral charter candidates Paul Vallas and Gery Chico schemed decades ago to obliterate community voice and democracy in low-income communities of color by designating hundreds of schools on probation, they eliminated those schools’ Local School Councils’ right to govern, oversee budgets, develop school improvement plans and hire and fire principals. 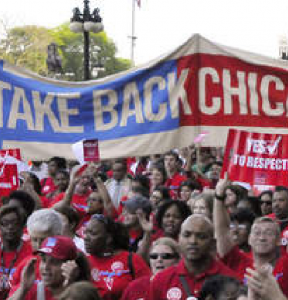 What we have now is just more of the same under Mayor Rahm Emanuel, who has continued a legacy of so-called school ‘reform’ and school closings in Black and Brown communities.